You can search for transits of a certain kind after the displayed end date. For example, on September 11, 2001, Saturn was within a 3° opposition to Pluto. Now an example involving personal transits. Suppose you are interested in occurrences of Uranus conjunct with C.G.Jung's natal Mercury from 1951 onward. Enter Jung's birth date and time (July 26, 1875, 19:30 GMT+1), and set the end date to January 1, 1951. Be sure to uncheck the 'Keep start/end dates' checkbox. Set the outer orb to 5° (ignore any error message regarding the other orbs). which shows that Uranus was exactly conjunct with Jung's natal Mercury on September 27, 1951; November 13, 1951 (when Uranus was retrograde); and June 28, 1952. So the 5°-conjunction of Uranus and natal Mercury in 1951-1952 was the last one to occur in Jung's lifetime (he died in 1961). Note that the values specified for the outer, middle and inner orbs don't affect the results of a transit search. which shows that (according to the sidereal zodiac) Uranus was exactly conjunct with Jung's natal Mercury on July 16, 1952; February 20, 1953 (when Uranus was retrograde); and April 22, 1953. 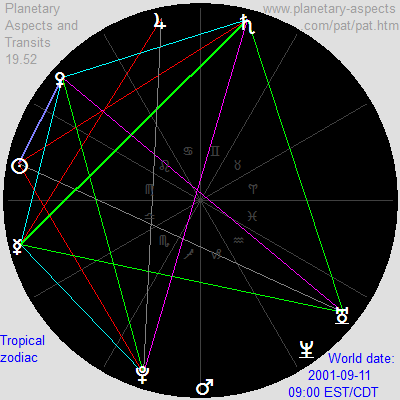 The yellow line is the transit according to the tropical zodiac and the gray line is the transit according to the sidereal zodiac. 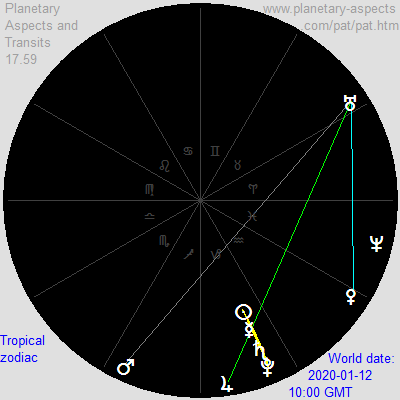 It can be seen that the dates of exact conjunctions are significantly different even though on any particular date the difference between the difference from exact conjunction in the two zodiacs is never more than about 1°. Now another example involving personal transits. This shows your Uranus return, with exact conjunctions on June 30, 2031; January 18, 2032; and April 11, 2032. By a similar process you can find the dates of your Jupiter and Saturn returns. Also you can find the dates when any of the outer planets first forms a square or an opposition with its corresponding natal planet. For example, using the birth date/time above, Uranus forms an exact opposition with the natal Uranus three times in 1987, on January 7, July 6 and October 26.